OVER 8000 cases of State Litigation are now registered with the office of the Solicitor General and 19 percent of those cases relate to police abuses and that is any matter, is absolutely outrageous, says top police boss. Police Commissioner Gari Baki said it is absolutely necessary take measures to reduce those huge liabilities. “We have over 8, 6000 cases of State Litigation are now registered with the Officer of Solicitor General and 19 percent of those cases relate to police abuses. “That in any measure is totally ridiculous and therefore it is absolutely imperative for the Constabulary to act decisively in our bid to reduce this huge liability. 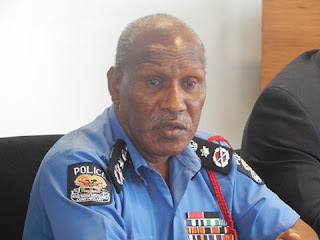 “We will put in place stringent firearms handling procedures and policies and conduct random checks and inventories to ensure members of the Constabulary remain strictly compliant with these values,” he said this when closing the Annual Police Commissioner’s Conference in Kimbe, West New Britain Province last Friday. He told the senior police officers during the closing that their ultimate objective is to reduce the number of state litigations arising from abuses perpetrated by members of the Constabulary. “The intermittent shootings over the years and public outcry demand for these changes to be made within the Constabulary,” he said. In this regard, he said there are three police legal officers secondment to the Office of the Solicitor General to fast track those backlog of cases which is a step in the right direction. The Commissioner said some of those drastic measures would see to introduce effective methods of court case management to adequately and expeditiously attend to all cases or allegations leveled against the Constabulary, introduce specialist firearms training and standardized the type of weapons to use, among others. The Commissioner said they will introduce specialized firearms training and standardized the type of weapons to be used by the Constabulary. “We will put in place stringent firearms handling procedures and policies and conduct random checks and inventories to ensure members of the Constabulary remain strictly compliant with these values,” he said. He said their ultimate objective is to reduce the number of state litigations arising from abuses perpetrated by members of the Constabulary. The intermittent shootings over the years and public outcry demand for these changes to be made within the Constabulary.